While supportive of this responsive measure, St. Peter’s Fireside Arts & Theology Resident Laura Klassen wasn’t sure if conventional counter-protesting was the best way forward. Sometimes it seems to merely fan the flames of division. In prayerfully pondering how Christians might constructively interact with the protests planned for Vancouver, Laura decided to pioneer an alternative. 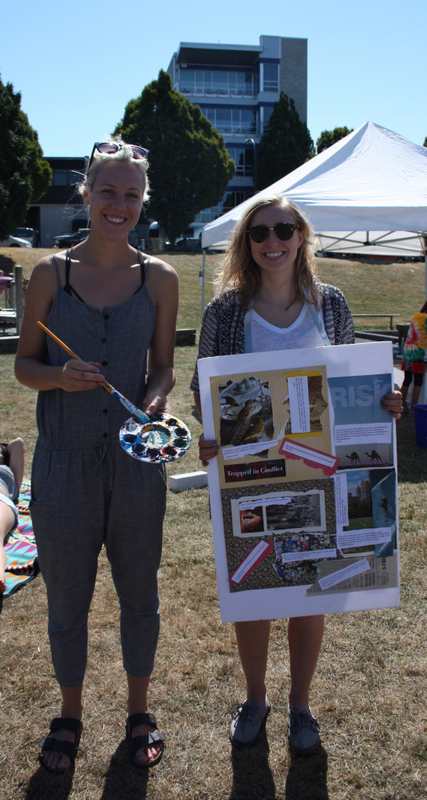 She called it Art in the Park: Creating for a Better Future. This idea flowed out of Laura’s recognition that God has created us to be creative beings. And out of our God-given creativity, we can create new avenues of dealing with familiar problems and struggles. She sought to provide a space wherein people could use art as a mode of response. Working with her friend Clara Salter, Laura decided to set up an “arts tent” a few blocks from city hall on the day of the rally. It was a place for anyone to come, create art, discuss the issues, and go on to the protest if they desired. On the day of the rally, the tent became a haven for constructive engagement with the surrounding events. Given that nobody knew how the protest would unfold, this safe space was crucial. Among other things, it provided a means for children to be present. Talking to the children as they made their art afforded a touching opportunity to dream about a better future in the midst of present trials. Over the day, there were children and adults painting alongside one another, both creating their first pieces. Artistic expression proved an apt vehicle for bringing people of all stripes and ages peacefully together to discuss visions of justice and hope for Vancouver’s future. In this phenomenon, we see how well art encompasses a shared experience of what it means to be human. In a small but meaningful way, Art in the Park also served to reframe the way that signs are used at tense rallies. Signs can often seem quite aggressive, a kind of “F-you” to the “other side.” Laura and Clara invited those who decided to make signs in the art tent to rethink their purpose. Guests who went on to the rally were encouraged to hang the pieces around their necks instead than holding or shaking them with fervor. This adjusted approach to sign usage sent a very different message—namely an ‘open-handedness’ towards everyone at the rally, regardless of ‘sides’. As I reflect on Laura’s service to our parish, I realize that one of the best things I did to lead (or guide) her in the residency was to create space for Laura to lead. Her Art in the Park initiative is not something I would have proposed but I am so glad that it happened. This turn of events rightly suggests that when it comes to inviting young people to consider a vocation in Christian ministry, one of the best things we can do is to afford them earnest space to pioneer new forms of worship, social engagement, discipleship, and witness. Yes, there will be failures but without experimentation, the church gets stuck—and it ceases to be relevantly and constructively engaged in the world of today. I am increasingly convinced that those who want to encourage potential future church leaders should create environments where failure in the midst of creative experimentation is okay. This is one of the secrets for helping to empower, cultivate, and encourage the gifts of future ministers, as they develop into the Christian leaders God is calling them to be. When I was a church intern years ago—exploring my own call to ministry—one of the most frustrating things I endured was the “tried that and it didn’t work mentality.” This was the excuse given to “shut down” fresh ministry initiatives that veered away from the status quo. I remember feeling so frustrated and defeated when my ideas were “tabled” in this manner. Oddly, now that I am a bit further along, I’ve encountered in myself the temptation to issue the same types of negations that once irked me so much. Laura’s story reminds me that our tendency to want to stick to the familiar can unwittingly close us off from wonderful, redemptive moments. I don’t want to miss such moments. Neither should you. So let’s help the next generation of church leaders blossom into God’s gifts for the world by allowing them to try things that we wouldn’t think of. Or even things that didn’t work when we tried them 10 years ago. Beautiful things might emerge. That’s what happened with Art in the Park.